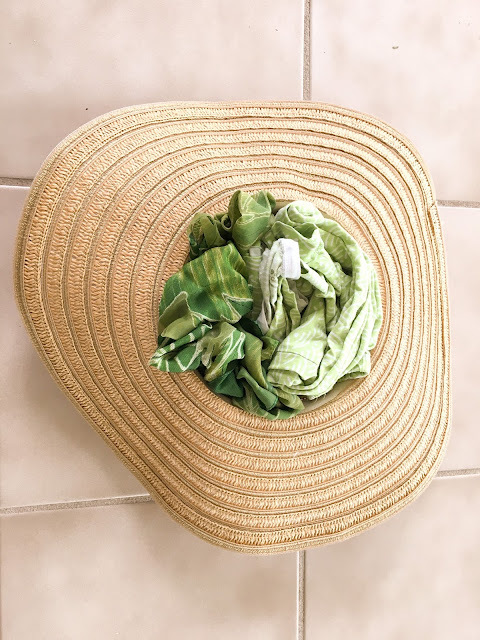 I wanted to share a few fun hats that I have been loving for spring and summer time. If you are planning a spring or summer getaway to somewhere warm, then you definitely need a cute hat to come with you! And, at the bottom of the post, I'll show you how to pack your hat in your suitcase to avoid crushing it. I've seen this hat a few times, but the cost of the original is $495. I have no business paying that kind of money for 1 sunhat, that would probably get crushed in my suitcase, or with my luck a bird would end up pooping on it. --Sidenote, I actually have had a bird poop on my head twice in my lifetime (so far). It' no fun I can tell you that! And, unfortunately I didn't have a hat on either time. Getting back on track...I've seen a couple of DIY posts about people making their own, and they turn out pretty cute, so I was considering trying it out. But, then as I was perusing Target's website recently, I stumbled upon this beauty! And, as you can guess, it was nowhere near $495. Try under $20! Man I love Target! Here's another option. I've always loved the look of fedoras, but I never thought my head was the right shape to pull them off. They always seems to look as if they were floating above my head, or like I had an elongated shaped head, much like Burt from Sesame Street. I found this Panama hat and I love it! The brim is wider and floppier then a traditional fedora, so I think that helps balance out the height. It was super comfy and stayed on my head in the wind much better then a large brimmed sunhat. It's very Cuban looking, so if you are going anywhere with a Latin culture, you should definitely pack one of these! I love my traditional sunhat with a golden flare. 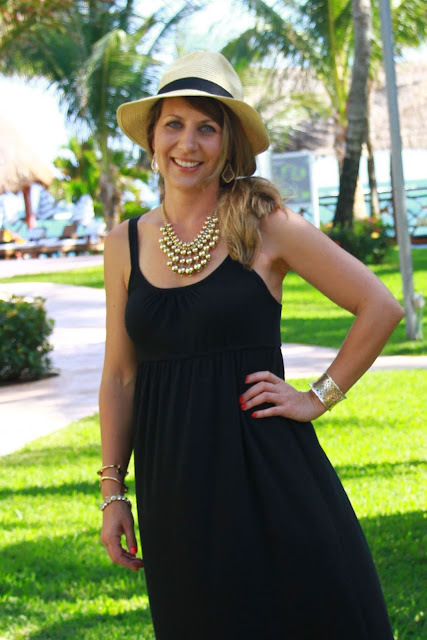 This is a favorite hat because it provides a lot of shade on my face and shoulders. I purchased mine a few years ago, but I found some others with fun flare! mint stripe / woven / pom pom / watermelon. I really like large sun hats for their shading abilities, but sometimes they get carried away with a big gust of wind! Lastly, I recently picked up this cadet hat and I have loved it! It's been nice to throw on when I don't feel like fixing (or washing) my hair, and it's a little more stylish then a standard baseball cap. It's not too tight on my head and the brim is a little bit smaller, which I like. Now that you have these cute hats to wear your tropical vacation, how on earth are you supposed to get them there? If it's not a huge hat, I often wear it on the plane. I wore the Panama hat on the plane for my last trip and it was very comfy. The bonus of wearing a hat on the plane is that you don't have to fix your hair...which is a huge plus when you have to wake up at 4am to catch your flight! A large sunhat might be a little more obnoxious to wear on a plane though. 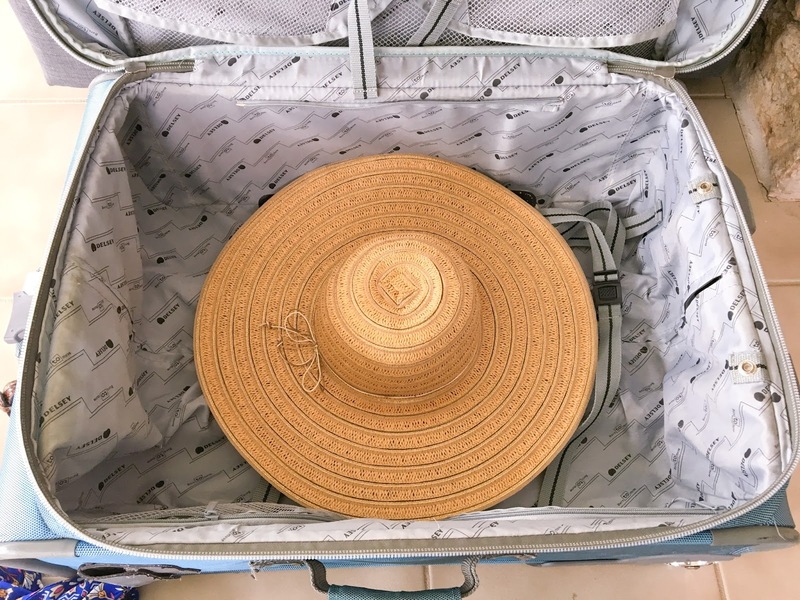 The best way I have found to pack a hat is to stuff the inside of it with clothing that won't wrinkle, or items that you don't mind if they are wrinkly. I use my swimsuits, pajamas, underwear, socks, etc. Stuff them inside of the hat to help it hold the shape. Then place the hat down in the suitcase first. The brim will stay nice and flat, and the stuffing will help prevent the rest of it from being crushed. 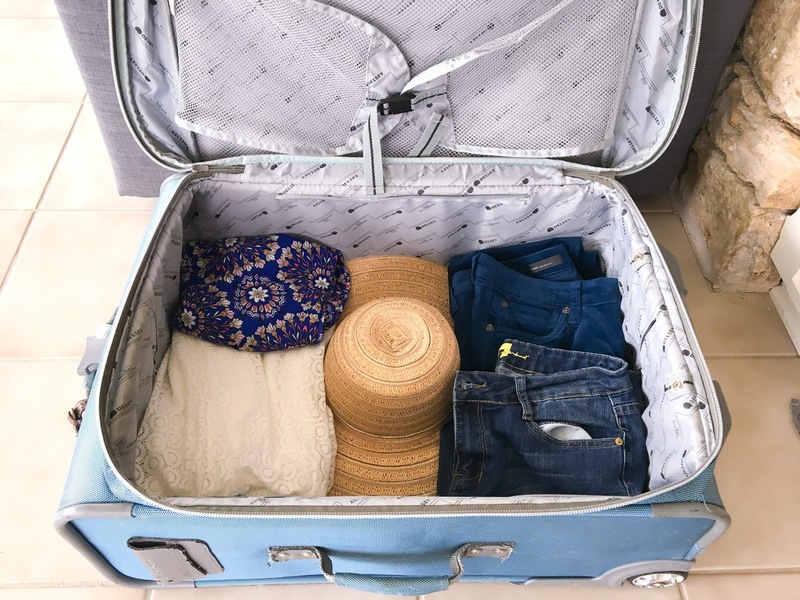 Pack your clothing around it and you are good to go! All of this talk about warm weather is making me want to plan another vacation! Summer can't come fast enough! **Some of the links in this post are affiliate links, which means I may make a small commission. This does not affect the price you pay but it does help me maintain my blog. So, thank you! Cute hats, just wish I looked good in them! I did enjoy ball caps better than wigs when having chemo, but that's it for me. You look cute no matter what you wear! Thank you! Hats are fun! I love wearing them but I often forget to put one on!